The diminutive Canon EF 40mm f/2.8 STM Pancake Lens immediately inspires the high-pitched talking-to-a-baby voice from its first-time viewers, with short drawn-out words and phrases such as "awwwwe" and "it's sooooo cuuute" being especially common. It is of course the size and weight of this lens that triggers this response. 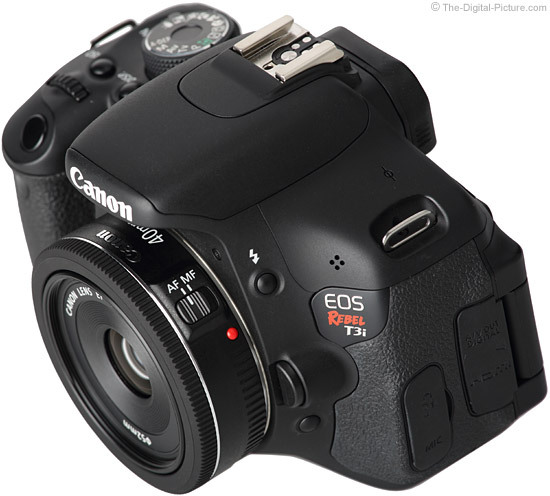 The EF 40 STM enters the world tied with the Canon EF 50mm f/1.8 II Lens for the lightest Canon EOS lens designation. And, being just over half as long as the 50 f/1.8 II, easily shatters the length record. This lens is even shorter than a Canon 1.4x extender (comparison below). But the size of this lens is not the only reason to not take it seriously. 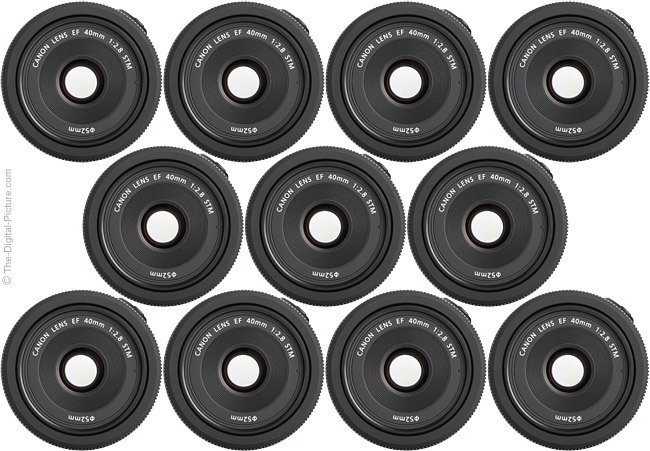 The pancake's breakfast-level price ranks it near the bottom of all currently available Canon lenses. You could buy 70 of these for the price of one Canon EF 800mm f/5.6L IS USM Lens. How many 40s would it take to consume the volume of one 800 L is a question I'm still pondering. It is indeed hard to take such a tiny, inexpensive lens seriously, but don't write the EF 40 STM off too quickly. With new acronyms in the model name, let's start this review with some quick definitions. You know what "Canon" means. You know what "Lens" means. 40mm is of course the focal length of the lens. 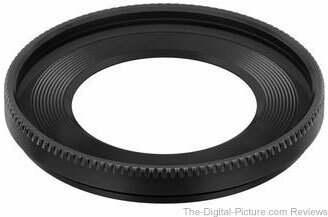 "EF" means that this lens will mount and function properly on all Canon EOS cameras produced to date. The new acronyms are "Pancake" and "STM". "Pancake", in lens speak, refers to a short, flat shape. "STM" stands for "Stepping Motor" - a motor that moves or rotates in small discrete steps (more info later in the review). With that understanding, let's move to an important lens decision factor - focal length. When choosing a lens, focal length should be one of your top selection priorities. Falling between the wildly-popular 35mm and 50mm focal lengths, Canon's 40mm focal length choice is an interesting one. While a 40mm lens sounds close to a 50mm lens (and the two can often be used interchangeably), there is a difference in the perspective these lenses provide when identical framing is used. 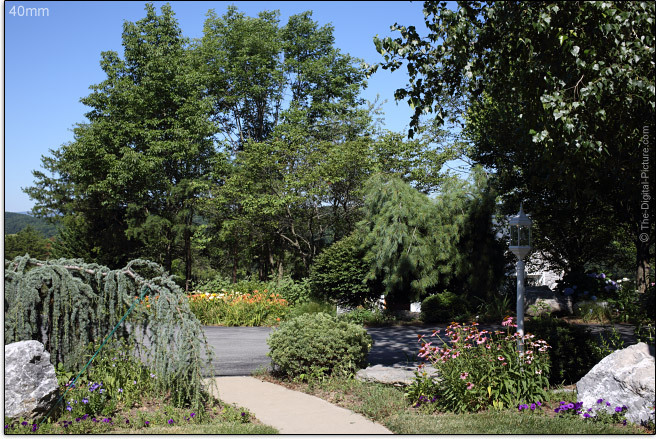 In the example below, the sides of the frame are nearly identical for each example focal length, but the large trees in the background change size greatly in proportion to the foreground due to the different focus distances required for the same framing. These examples were shot with a full frame camera. The same lenses used on an APS-C camera would of course frame more narrowly (40mm frames like 64mm on APS-C), but perspective differences would still show in identically framed shots. The wider angle lens will emphasize what is closer to the camera in relation to the background. The wider angle lens will also emphasize human subjects' closest parts - often noses - making them noticeably larger in relation to the rest of bodies if used at a close distance. 40mm is not a good head shot portrait lens. Step back and your subjects will be happier with their portraits. Portraits (not framed tightly) are but one of a huge range of uses for a 40mm lens. 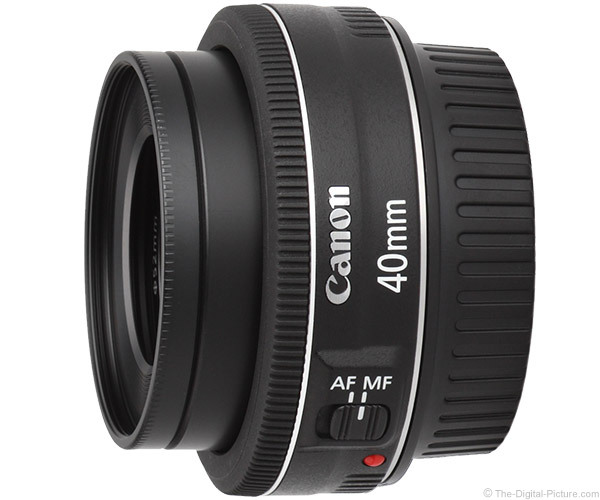 40mm is a focal length that you could leave mounted for general purpose needs. A downside to using a single focal length for all of your images is that your images can all begin to look similar. My preference is to use a range of prime lenses - in no more than 1/2 or 2x focal length increments. Adding to its multipurpose capabilities is the relatively wide f/2.8 aperture. While not wide for a prime lens in this focal length, f/2.8 is as wide as zoom lenses get. An f/2.8 aperture is usually what I consider minimum for stopping motion indoors. Here is an outdoor motion-stopped example. The sample picture above was captured with the Canon EOS 5D Mark III. Settings were ISO 200, f/2.8, 1/1250, AI Servo AF, Burst Mode, 5300K white balance and the Standard Picture Style. A B+W 52mm XS-Pro Kaeseman Nano Circular Polarizer was utilized for this shot. Not surprising with its small size is that the 40 STM Lens forgoes image stabilization. The relatively wide f/2.8 aperture makes this feature less missed. This lens is handholdable in lower light conditions. Small size and small price are great, but ... image quality is a sacrifice one would expect to make to gain these attributes. Amazingly, this lens delivers impressively in this regard. The Canon EF 40mm f/2.8 STM Lens is very usably sharp at f/2.8 with a modest increase in softness as the outer portion of the image circle is reached. Stopping down to f/4 results in a sharp image across the frame save the extreme full frame corners. At f/5.6, even the extreme full frame corners are very sharp - allowing this lens to compete with lenses at far higher prices. The ISO 12233 chart comparison tool will show you firsthand what these results look like - and will allow comparisons with the rest of Canon's lenses. Find this link at the top of the review. At f/2.8, the EF 40 STM shows about 2 stops of vignetting in full frame corners. This is a noticeable amount, but not a severe or surprising amount. Half of the vignetting is gone at f/4, but .6 or .7 stops remain throughout the balance of the aperture range. As usual, APS-C users will not have to worry about vignetting from this full frame-compatible lens. CA (Chromatic Aberration) is very well controlled - nearly absent. Same with flare. Even with the sun in the full frame corner, flare is hard to notice. Flare performance is certainly advantaged by the use of only 6 lenses in 4 groups. The 40 STM has very minimal distortion. Utilizing a circular 7 blade aperture, the 40 STM delivers a nice background blur quality as shown below. A 40mm f/2.8 lens is not going to set any background blur records, but when used at f/2.8 and a short focus distance, the background goes nicely out of focus. 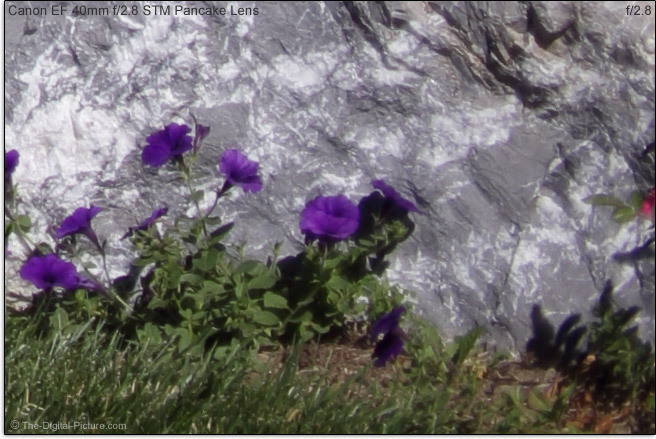 The site's ISO 12233 chart tool is ideal for directly comparing lenses to each other, but I took a couple of inexpensive and relatively similar lenses outdoors on a clear day for another comparison with the 40 STM. You will likely recognize these images as being the bottom right crop from the perspective comparison shown near the beginning of the review. Compared at the link below (click on the image) are the Canon EF 35mm f/2.0 Lens, Canon EF 40mm f/2.8 STM Lens and Canon EF 50mm f/1.8 II Lens. Extreme full frame corner crops will show a lens at its worst. The Canon EF 50mm f/1.8 II Lens is very well regarded for the image quality (sharpness) it delivers for its extreme low price. While it is a bargain, it is extremely low end in all other regards including build quality - which includes a plastic mount. My first 50mm f/1.8 II fell apart. It physically broke in half for no apparent reason. The 50 f/1.8 II compared here was purchased specifically for this review. The replacement lens does not perform as well as my first one did - I do think it is an inferior copy. But, it sure makes the 40 STM look amazing. The build quality difference is also as night and day. The Canon EF 35mm f/2.0 Lens is another inexpensive lens with an even closer-to-40mm focal length. This lens is sharp in the center of the frame, but does not have a flat plane of sharp focus - and corners are especially not rendered well. The 50 f/1.8 II and 35 f/2 both have the wider aperture advantage. The difference between f/2 and f/2.8 is one stop - one stop is a 2x difference in the amount of light delivered to the sensor. If you don't need that extra stop, the 40 STM is, in my opinion, the best option of this group. 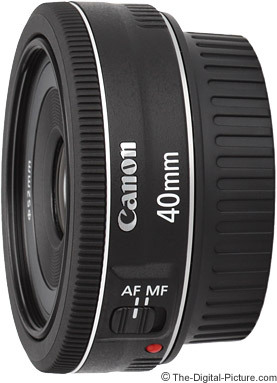 The 40 f/2.8 STM Lens is the first available Canon lens with the stepping motor AF implementation. The Canon EF-S 18-135mm f/3.5-5.6 IS STM Lens was simultaneously announced, but showed up in stock only as I put the finishing touches on this review. While I definitely prefer Ring USM focusing systems better, the STM design works well. It focuses reasonably fast and most importantly, accurately. The STM design is a focus-by-wire AF implementation. FTM (Full Time Manual) focusing is supported (if enabled for electronic manual focusing lens is selected in the camera's menu - the default), the focusing ring does not turn during AF. 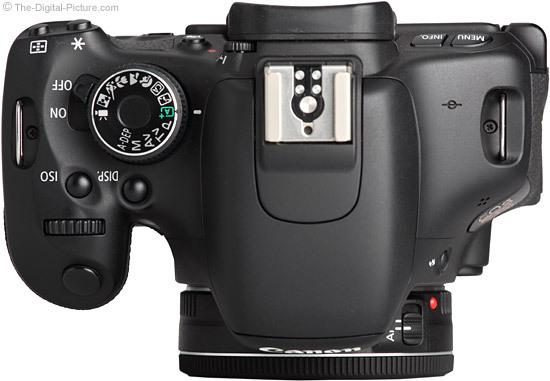 The lens' switch must be in the "MF" position - and the camera meter must be on/awake - for manual focusing. If the meter is inactive, MF does not function. The focusing ring size, like that of the rest of the lens, is tiny. However, being positioned at the outer-most position on the lens barrel, the MF ring is still quite usable. It easy to rotate and reasonably smooth. Expect some modest subject size change in the frame when pulling focus on this lens. The front filter threads do not rotate with focusing, though the lens' inner barrel extends modestly at minimum focus distance. There are no focus distance or DOF markings provided. There is no room for a window for such, and since the focusing ring is not directly connected to the focusing gears (same as with USM AF implementations), printed markings are not available. Most AF lenses produced today have no significant DOF markings. I doubt that anyone using this lens will care about these missing features. 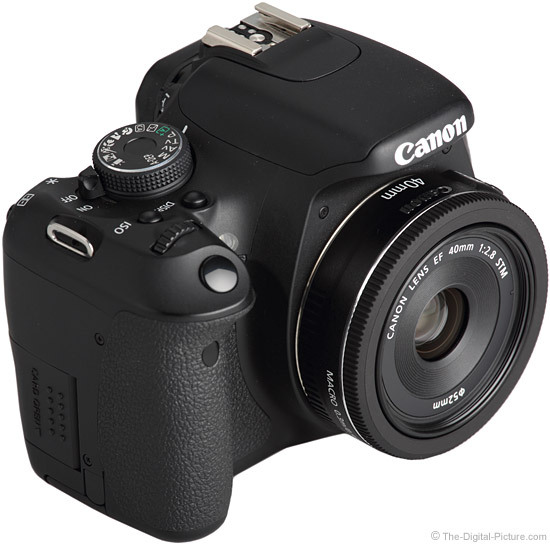 The Canon EF 40mm f/2.8 STM Lens was introduced with the Canon EOS Rebel T4i / 650D DSLR. 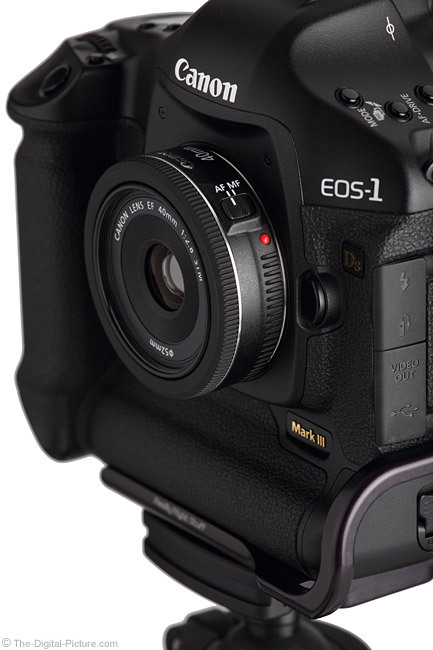 The T4i press release revealed that "When used with Canon’s new EF and EF-S STM lenses, the camera can provide smooth and quiet continuous AF while recording video." I don't doubt the "smooth" portion of that claim, but I'm more skeptical of the claim that the Rebel T4i will not capture focus motor sounds during video recording. My T4i Kit did not ship as of review time, but I can tell you that the 40 STM is not a silent focusing lens. While not as noisy as the Canon EF 50mm f/1.8 II Lens for example, the 40 STM emits a buzz when focusing. The noise is not bad, but I do expect some buzzing motor noise to be picked up by an in-camera microphone even on the Rebel T4i/650D - unless a sound cancellation or other technology is employed. Update: Confirmed. The 40 STM's AF sound is easily audible in Rebel T4i video when using the built-in stereo mic. In AI Servo mode, the 40 STM performs quite well. Honestly, I thought it would fall apart when given a reasonably challenging target. Of course, finding challengingly fast moving subjects that fill a 40mm frame (and do not impose a safety hazard to the photographer) is a bit of a challenge. The DOF at 40mm and f/2.8 is rather deep at the distances most often used for this purpose. 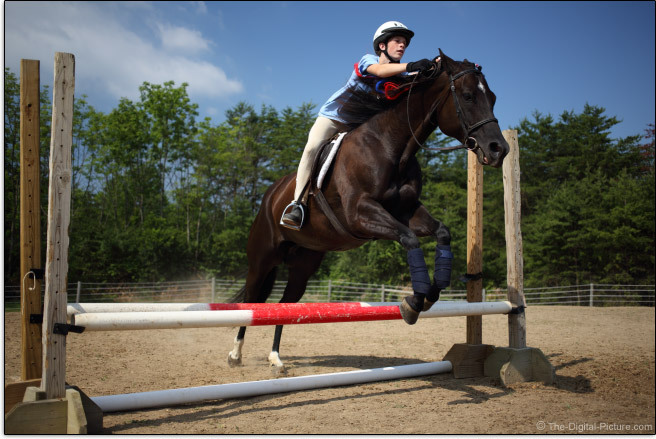 My hit rate on the cantering/jumping horse shown above was quite high. I much prefer the 40 STM's focusing system to the systems found in the Canon EF 35mm f/2.0 Lens and Canon EF 50mm f/1.8 II Lens. 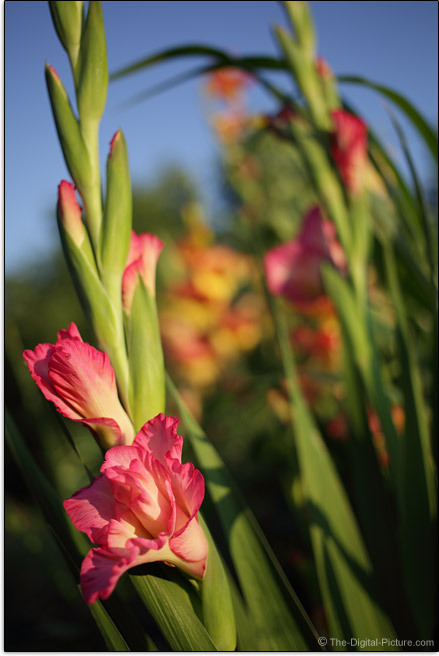 Wide angle and normal focal length lens MFD/MM values typically change dramatically when used with extension tubes. The	Canon EF 12mm Extension Tube II takes the MM value 0.50x and the Canon EF 25mm Extension Tube II takes the MM value 0.88x. This lens is not compatible with Canon's extenders. If you look at the comparison photo at the top of this page, you will see that it appears like the extender would protrude half way through the 40 STM. This is a bare bones lens - but it feels well made. The body is constructed of engineering plastic with a standard metal mount. The other external components include a single switch, an extending inner lens barrel and a tiny MF ring. The MF ring has very little play/wobble in its design. For many more comparisons, review the complete 40 STM Specifications using the site's Lens Spec tool. You will not have to worry about this pocket lens blocking your DSLR's built-in flash. 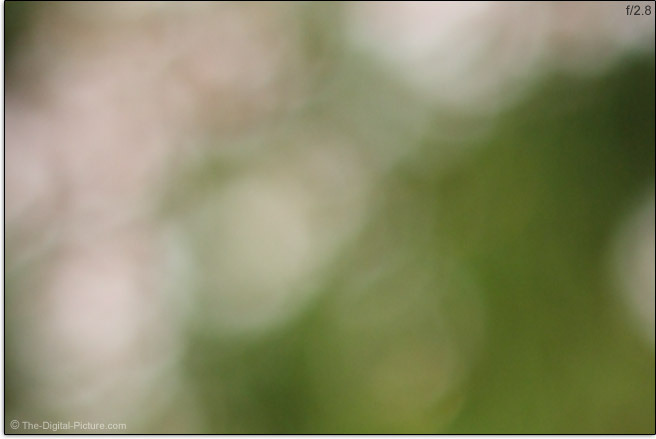 Some of Canon's tiniest lenses are shown below. Unfortunately and as with most of Canon's non-L lenses, the Canon EF 40mm f/2.8 STM Lens does not ship with a lens hood included. I typically recommend using a lens hood most of the time, but not in this case. 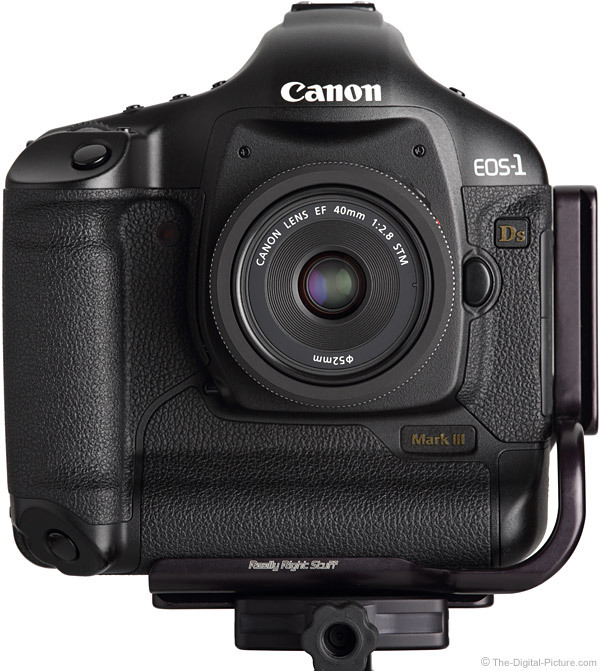 I fail to understand the purpose of the thread-on Canon ES-52 lens hood (shown above). It is far too shallow to block any appreciable amounts of light - even from a far wider angle lens. And it is far too shallow to provide any appreciable protection from physical incidents. Perhaps I just need someone to set me straight on the purpose of the ES-52, but I think it is a complete waste of money and couldn't even bring myself to buy it for the product pictures. I'm not sure that this inexpensive lens justifies a protection filter, but the small 52mm filter size keeps the price low. Circular polarizer and ND/graduated ND filters are of course vey worthwhile to have - and again, 52mm filter are among the smallest and least expensive available. No case is included in the box, but this baby lens could really use a cute little pink or light blue storage pouch. A LensCoat would also be cute. 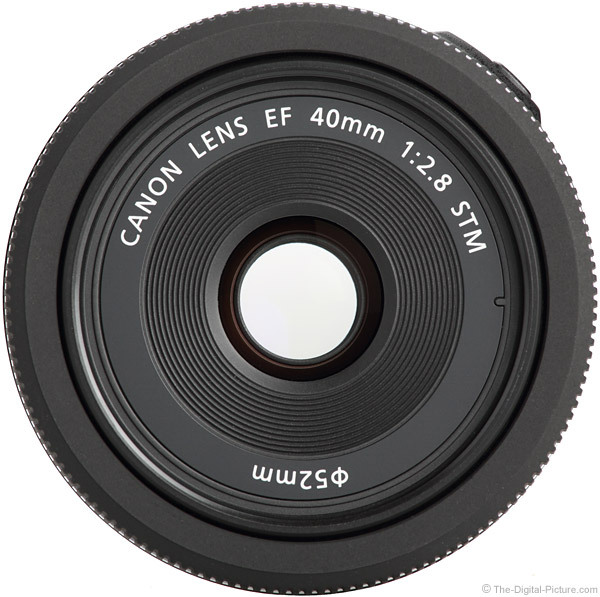 The Canon EF 40mm f/2.8 STM Lens is a member of the "Canon EF" family of lenses. 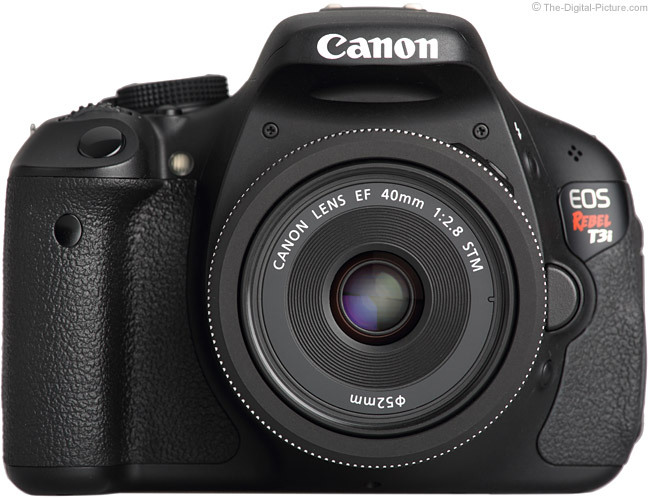 This means that it is compatible with all Canon EOS cameras as of review time. Interesting is that Canon released an EOS 5D Mark III firmware update to improve functionality with the stepping motor in this lens. 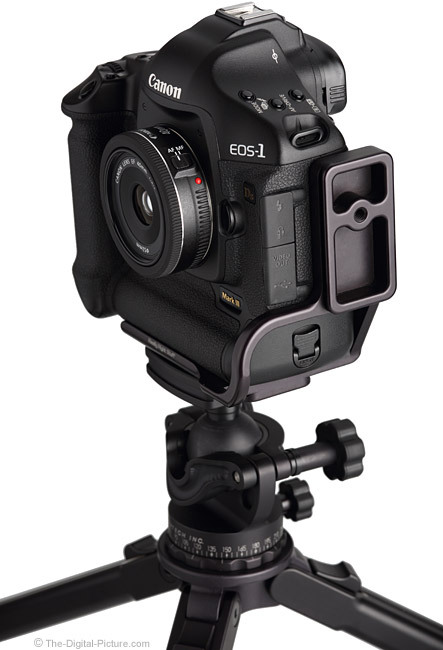 I'm not sure how this fixed issue relates to all previous EOS DSLRs. Overall, I’m finding very "little" to not like about this tiny, inexpensive lens. It is not hard to justify this purchase. Keep a pancake in your pocket - even for use as a backup lens.